Each day I come into the office, I have the chance to help people live longer, happier lives by giving them optimal oral health. I know I have truly made a difference when I see a patient leave the office with the confidence that can only be found in a beautiful smile. 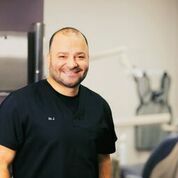 Along with the rest of my team at Phoenix Dental Center, I want to make people feel comfortable and actually enjoy being a part of our dental family. I grew up in Beaverton, Oregon where I graduated from Beaverton High School and obtained my Bachelor of Science from Portland State University. I then went on to earn my Doctorate of Dental Surgery at the University of Maryland School of Dentistry. I had the opportunity to complete my dental externship at Johns Hopkins University, a world leading teaching and research university. Each year I continue my education, studying the latest advances with the nation’s foremost clinicians. This extensive focus on education allows me to offer my dental patients today’s state-of-the-art techniques with an emphasis on cosmetics, dental implants, surgery, periodontal treatment, root canals, and complex restorative dentistry. When not in the office; I enjoy biking, boxing, basketball, and skydiving. Please contact Phoenix Dental Center to schedule an appointment with Dr. Nordean. We offer several different dental treatment options to meet your needs. We hope to hear from you soon!